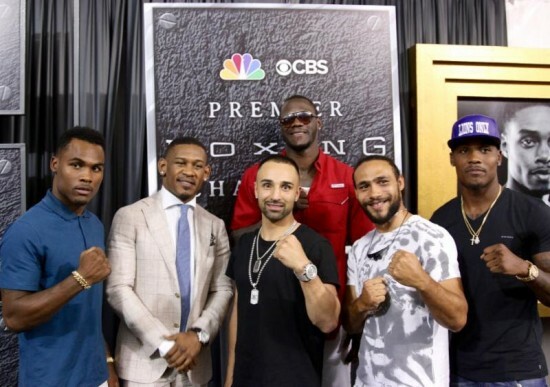 LAS VEGAS (June 20, 2015) – Stars of Premier Boxing Champions hosted a media luncheon Saturday afternoon at the MGM Grand in Las Vegas and offered their thoughts and predictions for tonight’s PBC on NBC main event, which features a battle between former world champions Adrien “The Problem” Broner (30-1, 22 KOs) and “Showtime” Shawn Porter (25-1-1, 16 KOs). Televised coverage begins on NBC at 8:30 p.m. ET/5:30 p.m. PT. Carson, CA, August 16, 2014 — Turns out, it was Showtime … for “The Special One,” Kell Brook. In a minor upset, Britain’s Kell Brook (33-0, 22 KOs), of Sheffield, England, won a battle of undefeated welterweights and the IBF world title with a majority 12-round decision over defending champion “Showtime” Shawn Porter (24-1-1, 15 KOs), of Cleveland, Ohio, Saturday on SHOWTIME from StubHub Center in Carson, Calif.
WASHINGTON, D.C., March 17, 2014 — Two world championship fights on one night is great for boxing fans. But Golden Boy Promotions and SHOWTIME believe that three is even better. So, on Saturday, April 19, joining the title fights between Bernard “The Alien” Hopkins and Beibut Shumenov and Peter “Kid Chocolate” Quillin and Lukas Konecny there will be a battle for the IBF Welterweight World title between champion Shawn “Showtime” Porter and former two-time and two division word champion and current NABF Welterweight titleholder Paulie “Magic Man” Malignaggi, making this tripleheader at the D.C. Armory in Washington, D.C. a must see. 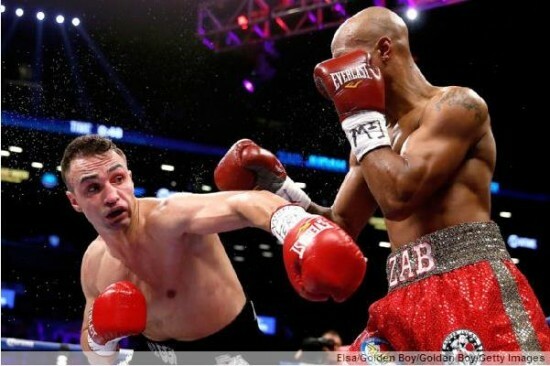 BROOKLYN, N.Y., December 8, 2013 — Two weeks after his 33rd birthday, Paulie “The Magic Man” Malignaggi (33-5, 7 KO’s) picks up his 33rd win in a unanimous decision victory over Zab “Super” Judah (42-9, 29 KO’s) in front of his hometown crowd at Barclays Center in Brooklyn, NY. The fight, promoted by Golden Boy Promotions, headlined a four-fight SHOWTIME CHAMPIONSHIP BOXING event. Mike Lee Blitzes Quattrocchi in 1, Looks forward to Facing Elite Opposition! Mike Lee Arrives in Chicago for ‘Rosemont Rumble’ to Go for 20-0 vs. Aaron Quattrocchi! Evander Holyfield’s Real Deal Sports and Entertainment Returns to Louisville on Thursday, Sept. 28th! Heavyweight Contender Fres Oquendo’s Asking for Help with the Passing of Nephew, Henry Oquendo Jr.
Showtime Analysts Paulie Malignaggi and Al Bernstein Join Chicago’s Ray Flores on CBS Network Nationally Televised ‘Dome at the Ballpark’ in Rosemont! Third Annual Chicago Boxer’s Reunion on Friday Night!